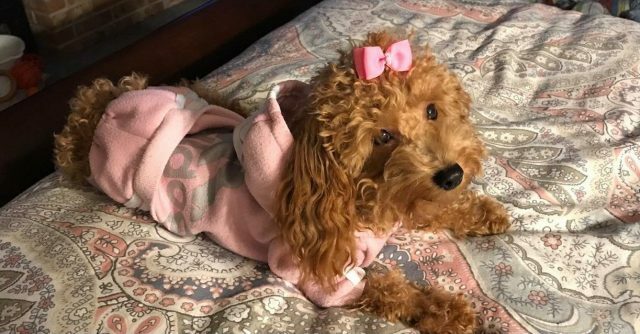 A psychologist who lives in the township says her 10-month-old emotional support dog may have been taken from her yard earlier this month. Alysia Weismantle has been making postings on social media, putting up flyers and conducting searches in the area of her family’s home on Mohawk Trail after her dog Rosie disappeared March 1. Weismantle, who is a psychologist at There is a Solution Counseling Services in Cranberry Township, said her husband left their house briefly that day and returned to see Rosie in the driveway — which was unusual because she had been left inside the house locked behind a gate. He parked his vehicle and seconds later Rosie was gone, she said. Rosie is a brown toy poodle weighing about 5 pounds. She was wearing a pink collar and a bark collar that has a blinking green light. She goes to the psychology practice every day and provides emotional support to clients there. The family is offering a reward for her return. Anyone who has information about the dog is asked to call 724-234-5134.